The newest addition to the Bhutanese royal family got quite the welcome: 108,000 saplings were planted in honor of the prince’s birth. While trees may seem a bit of an unconventional albeit thoughtful baby gift, the tree planting ceremony actually served as a sort of prayer-filled tradition and was held one month after the baby’s February birth. After each sapling was planted, the volunteer who planted it said a prayer for the newborn and for his health, his character, and his future as a leader. Trees are an integral part of Bhutanese culture as they are known as the provider of life, offering nourishment and symbolizing traits such as longevity and compassion. On the same day that the country planted 108,000 trees, the Ministry of Tourism also opened a Happiness Garden with the hopes of having foreign visitors to Bhutan plant a tree to represent their country. Bhutan is famous for its Gross National Happiness principle, which seeks to strike a balance between economic growth, environmental stability, and general well-being of the country’s citizens. The environmental aspect is held especially sacred in Bhutan with constitutional rules for keeping 60% or more of the country under forest cover and a Guinness Book of World Records title earned last year when 100 volunteers planted almost 50,000 trees in under an hour! 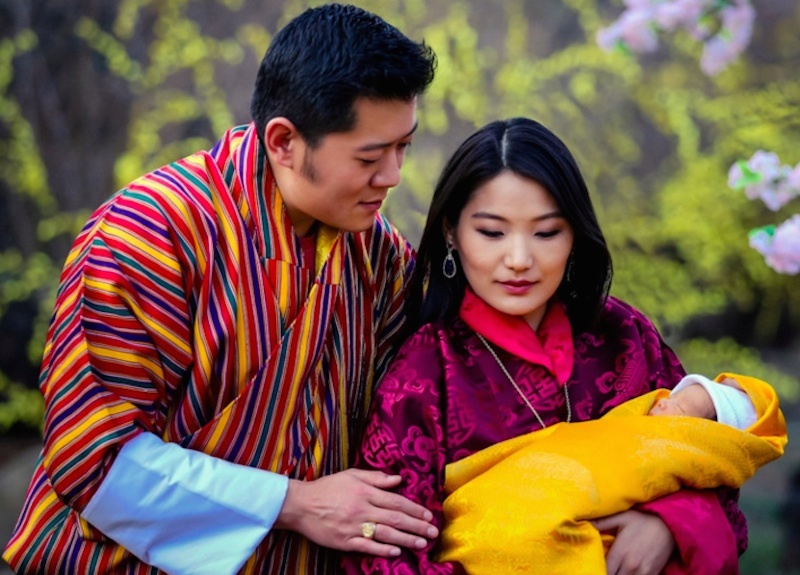 If this royal first born grows up to be anything like his green-minded parents and grandparents, we hope he’ll spread the positive environmental message beyond the borders of Bhutan and knock some sense into the materialistic, grandiose, heavy-carbon footprint leaving leaders around the rest of the world. The newest addition to the Bhutanese royal family got quite the welcome: 108,000 saplings were planted in honor of the prince's birth. While trees may seem a bit of an unconventional albeit thoughtful baby gift, the tree planting ceremony actually�served as a sort of prayer-filled tradition and was held one month after the baby's February birth. After each sapling was planted, the volunteer who planted it said a prayer for the newborn and for his health, his character, and�his future as a leader. Trees are an integral part of Bhutanese culture as they are�known as the provider of life, offering nourishment and symbolizing traits such as longevity and compassion. On the same day that the country planted 108,000 trees, the Ministry of Tourism also opened a Happiness Garden with the hopes of having foreign visitors to Bhutan plant a tree to represent their country. Bhutan is famous for its Gross National Happiness principle, which seeks to strike a balance between economic growth, environmental stability, and general well-being of the country's citizens. The environmental aspect is held especially sacred in Bhutan with constitutional rules for keeping 60% or more of the country under forest cover and a Guinness Book of World Records title earned last year when 100 volunteers planted almost 50,000 trees in under an hour! 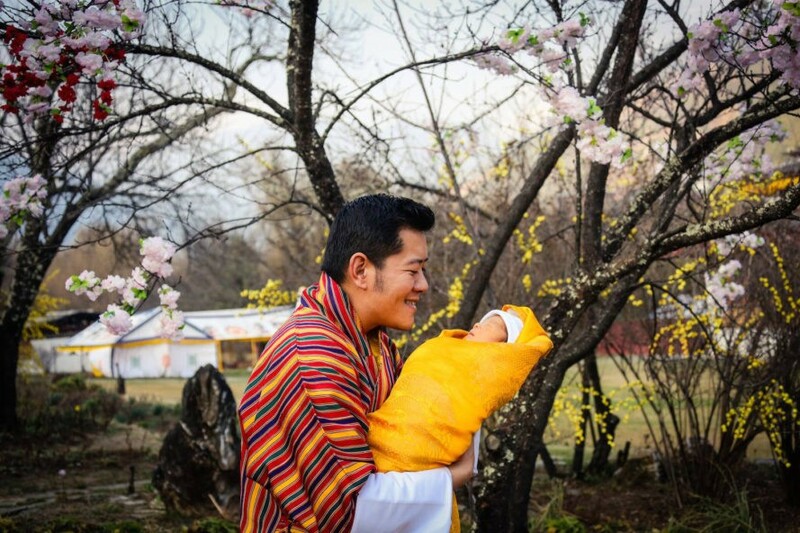 If this royal first born grows up to be anything like his green-minded parents and grandparents, we hope he'll spread the positive environmental message beyond the borders of Bhutan and knock some sense into the materialistic, grandiose, heavy-carbon footprint leaving leaders around the rest of the world.